Matthew joined the Merivale Practice in 2001, taking over as Principal in 2007. After gaining his BDS from Bristol University, Matthew completed the one-year Tatum course on implantology and bone grafting, studying under the pioneering American dentist, Professor Hilt Tatum, plus a further year-long training course in BioHorizon implants. 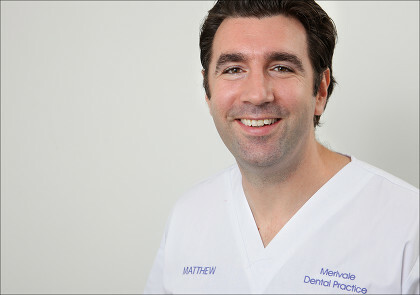 As well as Dental Implants, Matthew also has a special interest in Endodontics (root canal treatment). He has also achieved the Denplan Stairway Award, a tough postgraduate programme involving training courses, personal study and in-surgery audits. Most recently he was awarded his Masters in Advanced General Dental Practice from Birmingham University, graduating with Distinction. In 2017 he was invited to join Guy's, King's & St Thomas' Dental Institute as a Clinical Tutor for undergraduate and postgraduate dental students. In his spare time he enjoys skiing, tennis, boxing, rugby and travelling.